Will Koreas jointly mark centennial of independence movement? SEOUL, Jan. 11 (Yonhap) -- This year South and North Korea, which were divided after the end of World War II in 1945, will mark the centennial of the March 1, 1919, independence movement against the Japanese colonial rule of the Korean Peninsula in the early 20th century. North Korea also regards the independence movement as a monumental event. The North's political dictionary defines the nonviolent demonstration as "the Korean people's patriotic whole-nation struggle against Imperialist Japan's barbaric colonial rule and for national independence and freedom." But the Koreas evaluate the uprising a little differently due to their respective ideologies and political systems. Experts are in unison that it's the right time for the Koreas to jointly re-evaluate the movement on the occasion of its centennial amid an ongoing thaw in their ties. 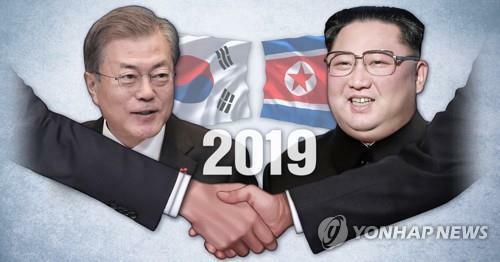 South Korean President Moon Jae-in and North Korean leader Kim Jong-un, indeed, agreed in their Pyongyang Declaration adopted in September last year to jointly celebrate the centennial of the movement. The joint celebration, if realized, will be a catalyst for complete joint research on the movement. Moves to jointly mark the anniversary are under way at the civic level as well. The Seoul-based Committee for Projects to Mark the Centennial of the Independence Movement already discussed the issue with the North's National Reconciliation Council during its visit to Pyongyang in November and is waiting for its reply. "We've proposed to the Council joint projects to explore North Korean areas where demonstrations took place on the first day of the March 1 movement, to set up a monument and to hold meetings on it," Park Nam-soo, the committee's head, said. Experts point out, however, that the realization of the joint projects relies wholly on inter-Korean relations. In reality, historians of the Koreas carried out joint studies on the movement in 2007, when inter-Korean exchanges were brisk. But the studies came to a halt the following year when the conservative Lee Myung-bak government was inaugurated in the South. "It's essential for the Koreas to study the history and language to understand differences between each other and make exchanges," Suh Joong-seok, a professor at Sungkyunkwan University in Seoul, said. "But what is the most important is to go ahead with joint studies based on facts and data."